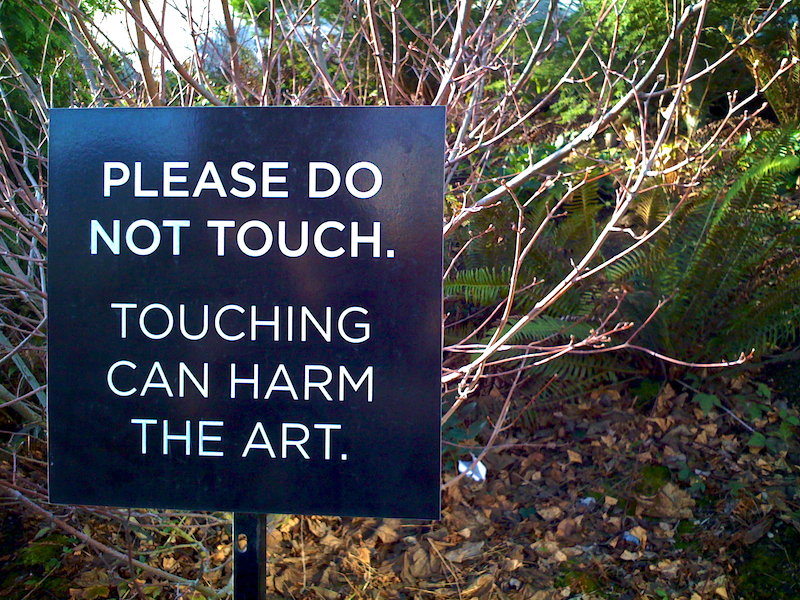 PHOTOGRAPHY » Please Do Not Touch. This sign sits outdoors in the middle of Seattle’s Olympic Sculpture Park, amidst massive public works of raw, rusty metal. These are gravity defying beasts of a massive scale, and it struck me as odd— especially given that the rain, sun, snow, and wind should seemingly have a much more profound impact on the art than a simple human could ever have. Clearly, this sign couldn’t have been put there to discourage graffiti. And there is no way a screaming flock of children would take time out of their game of tag to reconsider the longer lasting effects of their sculpture garden hiding places. Nor would the elderly even fathom a jaunt up into the brush and shrubs to lean in for a scrub. Therefore, I had to assume this sign is aimed at me. So then, despite the fact that I didn’t even have an urge to touch the public work… I sauntered over to the nearest indestructibly weather-worn object and neatly planted a high-five. In regards to this snapshot’s composition, what really makes the photo for me is twofold. First, that the sign is nowhere near the art, and instead serves more as an ironic statement about mankind’s relationship to nature. Second, that the trash in the background is doing far more damage to the beauty of the park than anything I could ever personally incur. Enjoy (…and feel free to rub your grubby hands all over it).